On the surface level I think we mothers might ask ourselves, 'why make more work when I'm not required to do this and be socially accepted?' Perhaps for the women that do choose to tandem feed it IS making life easier, depending on how you view easy. Would it be easier to deal with sibling jealousy and insecurity in another way, or is it easier to lay foundational groundwork with the most fundamental motherly act that exists (outside of giving birth itself)? Would it be easier to try and verbally explain to an unstable toddler that their new sibling could never replace them or never take from the love you have for them, or is it easier to show them this with nursing? When you look more deeply at the long term work that tandem breastfeeding saves, I think that it makes motherhood overall easier. This is difficult to deny when I've seen tantrums based in jealousy and fear of loss dissolve in seconds just because of one tandem nursing session, and I've seen my own fears of incompetence and guilt dissolve right along with it. Both our hearts soften and a moment of anxious tension becomes a moment of connective, loving joy that is powerfully beautiful and miraculously magical. The other benefit that is really striking for me is perhaps more related to a full term nursing benefit. Toddlers are challenging, often times irrational, intensely emotional and inexplicably difficult to get through to. When a toddler is having a rough moment, I've found that nursing can be the most effective solution. If you happen to be holding an infant who is crying and your toddler is melting down, it is even more effective. I have found tandem nursing to be an essential part of my mothering tool belt. Successful breastfeeding relationships are anchored in reaching a place of comfort with nursing. It can have daily moments of frustration, pain or discomfort but overall a breastfeeding relationship that lasts is rooted in finding a healthy amount of peaceful expectation and ease. How is this ease, this comfort, to be attained in an environment that can name you immoral or immodest for doing the very this that is THE best thing for your baby? How is a women to feel confident, relaxed and at joy in a breastfeeding relationship when she feels afraid to nurse out in public? Just as with birth, breastfeeding is an instinctual, emotional, personal process that is effected by our feelings toward the act. Fear is the number one inhibitor to a positive birth experience as it effects positive birthing hormone levels. When fear is present, Oxytocin, the love hormone which stimulates contractions and pleasureable birth expirience through endorphin release, is replaced with Adrenaline and Cortisol, the fight or flight and stress hormones, resulting in less effective and more painful contractions. Why wouldn't the same be true for breastfeeding when the two acts are biologically linked and work together as a source of creation? Oxytocin also mediates the milk ejection, or letdown, reflex and is released in pulses as the baby suckles. Adrenaline and Cortisol hormones, which stem from the emotion of fear, directly diminish Oxytocin, effecting supply and emotional attachment to nursing and baby. 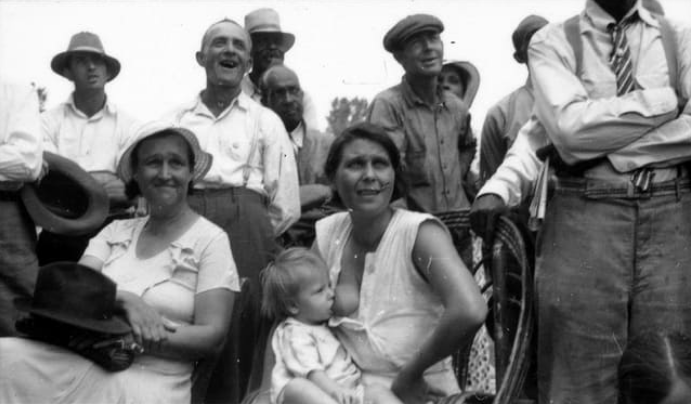 It is necessary to consider that when we shame a mother for breastfeeding in public or shame the act itself by asking her to hide it beneath a cover, we are saying to her, 'what you are doing is not acceptable and if it must be done, it must be hidden.' This shaming causes anxiety and eventually a fear response, having an effect on how mothers can sustain their milk supply, and how they can sustain healthy transitions into motherhood. A women feeling shamed into hiding her breastfeeding in public will experience greater incidents of anxiety & depression relating to motherhood. She will experience lower milk supply as her Oxytocin levels drop and will most likely begin to avoid social interaction in attempt to avoid spikes in Cortisol, creating an overall environment primed for resentment toward motherhood and for the negative feelings and ostracizing it brings. It would not surprise me if these feelings of shame and depression are connected to the low breastfeeding numbers for the US. Wouldn't you want to stop breastfeeding if you felt intense anxiety every time you left your house and a fear that your child/ren may want to nurse? Wouldn't being denied healthy social interaction, which also releases Oxytocin, make you want to stop breastfeeding your child/ren? I know these fears effected my family. And how did these fears apply to a family like mine, nurturing a tandem breastfeeding relationship? I remember saying to my husband several months after the Human Services Agency/Sheriff call and visitation that if I really wanted to get myself arrested I'd go tandem breastfeed at a park. 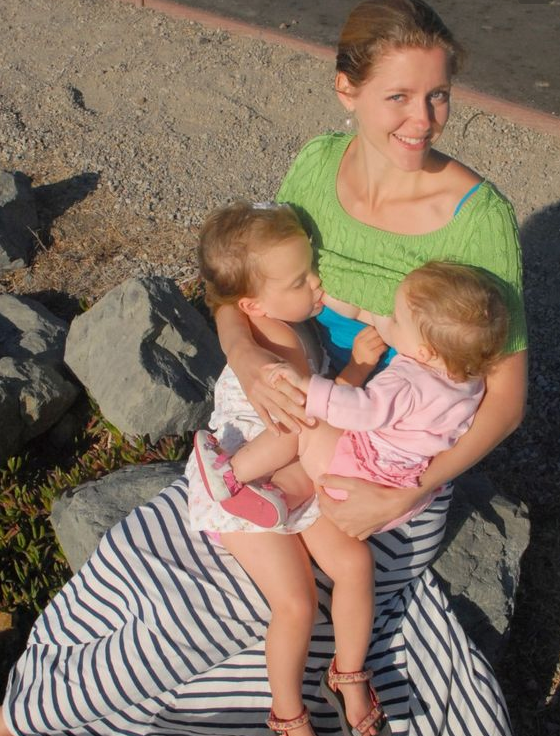 My own statement stuck with me, and even though I knew that breastfeeding in public was, and continues to be, legal in California, I realized how deeply unaccepted the act of tandem breastfeeding was and how terrified I was to do it outside our home. 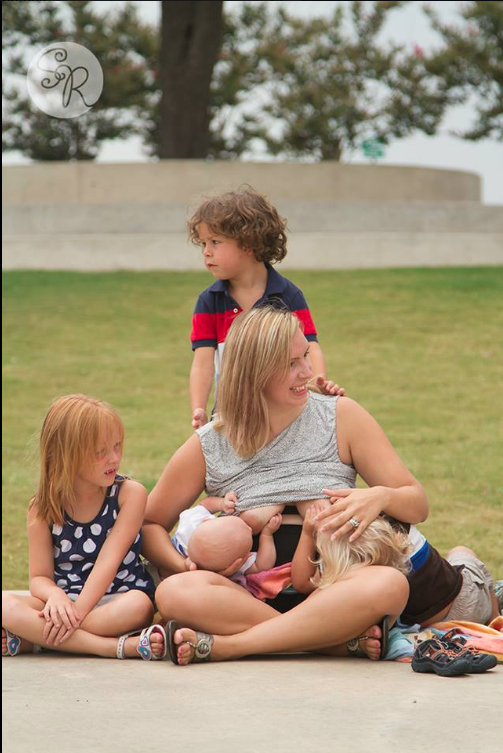 For me, being afraid to tandem breastfeed in public has deeply impacted my children and family. In order to support my toddler who was 11 months old when we discovered we were pregnant withour 3rd child, I continued to nurse her through the pregnancy, after the birth and beyond. Her security was rooted in this relationship with me and her loving relationship with her brother, I felt, rooted in my tandem nursing them both from the beginning. If I went into public and found myself in a situation where both children were expressing their nursing need simultaneously I would experience explosive anxiety and do my best to get to the car before the situation became eruptive. This phase, when my toddler could not be negotiated with or wait for her turn, was a time that was best spent indoors as I could not afford to suffer through the stress of such an experience very often. I felt confined to my house and my oldest child, who was four at the time, was effected by this. I felt torn between their needs wishing that we lived in a world where we could be accepted in public for the place we were at as a family. When I was able to negotiate and postpone nursing sessions with my toddler it became much easier, but I pressured her more then I would have liked to in order to get there, and felt guilty as a result. Even at home our tandem nursing sessions were always marked with a degree of shame on my part. I knew I was making the best choice for our family but the social pressure did effect my mind state during such a sensitive ,vulnerable time. As mothers our bodies were made to nourish our children in a state of Oxytocin induced love that supports the relationship between mother and child, strengthens the family and thereby strengthens the community. Using our hormones as a guide, support of public uncovered breastfeeding blossoms the Oxytocin/Endorphin release between infant and mother, diminishing the Adrenaline/Cortisol release, thereby creating an atmosphere of love within mother and baby as opposed to fear, stimulating loving acceptance and joyful release of social Oxytocin between mothers and strengthening the foundation of the community immensely. This is a human right, no? A foundation of love as opposed to a foundation of fear in our communities? Simply put, using breasts for feeding a child is a human right that lifts us up as a society through loving compassion and nurturing generosity. Let us celebrate the breastfeeding woman, whether she uses one breast to feed her children or two to feed them. It is love and peace it represents. Let it be so. And when you see her, smile, because you are seeing something that is lifting up us all. Something amazing is happening in my house. It takes strength and courage and gratitude and love and patience and kindness and tolerance BUT, I can't share it or tell anyone about it because....why? Why can't I share this moment? Why can't I share this completely healthy beautiful transcendent moment of love and pain and perfect imperfection with my community? For me, the fact that there is a question that this is somehow not acceptable means that it NEEDS to be shared in order to change the status quo. In order to ensure that the next generation grows up without a FEAR of breastfeeding they need to see, on a regular basis, images of women breastfeeding, and yes, they need to see images of women breastfeeding 2 children at once. Because sometimes children arrive close together, or more then one at a time, or sometimes the weaning process is a longer journey then expected...we need to see these images. We need to honor these images. We need to love these images that strive to support the future of the sibling relationship by supporting it on the most fundamental level. It needs to be a norm that images like this are considered beautiful moments of courageous motherhood, it needs to be LOVED not feared, it needs to be adored not questioned and it needs to held up as a model not torn down as a threat. We will find that our communities will strengthen and be filled with far more giving and far more love when we can accept and cherish breastfeeding mothers, and encourage them to share the life process they find themselves in. Social media is about sharing your personal NOW. What is more NOW to a mom with young children then how she feeds them, how she takes care of them? Breastfeeding defines the life of mothers with young children. Breastfeeding defines my life. I picture a community one day that reveres and holds this mothering activity to the highest level and is all the better because of it. 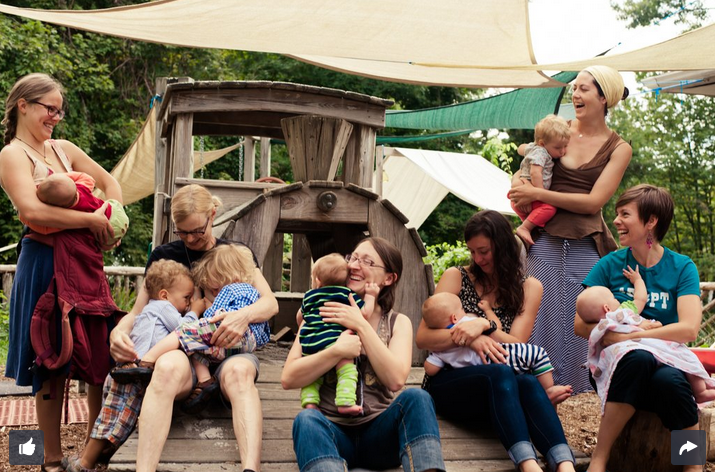 And I imagine the communities that experience higher ages of breastfeeding and higher rates of tandem breastfeeding experience greater peace in the community and more love overall. Let's join the rest of the civilized world who understand this...breastfeeding is essential to community health. For a new, big sibling the arrival of a baby is momentous, tremendous and terrifying. One of the questions I feel from them is, "What changes for me now?" In the first meeting the fears and excitements swell and if a new, big sibling is currently breastfeeding, there will most likely be an immediate desire to go to the breast and nurse in order to secure themselves to mom and secure that they still have what they had before. I think too anything new can trigger some destabilization and a desire for comforting, and for a nursing toddler comfort=breastfeeding. When my older two children came to join us in the room right after the birth, I knew there would be a space to hold. 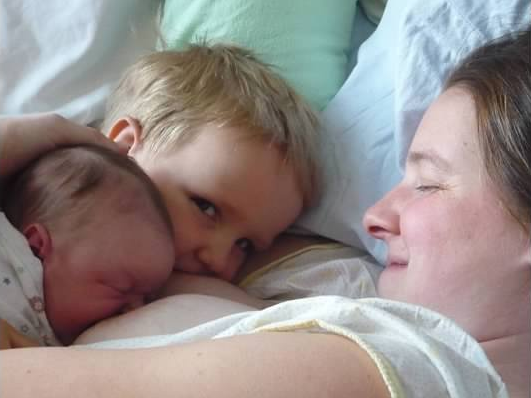 As my daughter, at 20 months old, came for my arms I knew she'd want to nurse. I was exhausted of course, had yet to push out the placenta and was holding a 5 minute old who was just starting to latch. 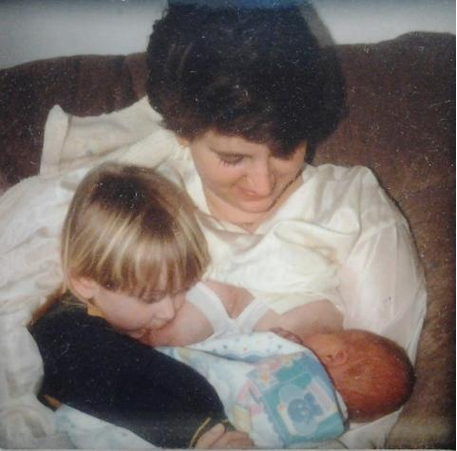 I did not want to give more in that moment but I knew giving in that moment would save time and energy in the long run by providing a a formidable foundation of equality between my 2 nursing children. Creating this foundation applied in a different way for my first and second born. When she arrived, my first did not ask to nurse immediately as he no longer did daily, more like weekly at that point. He did have that moment in the first week after birth, however, when he asked to nurse in tandem. I think in total I nursed them both together about 3 times for about 10-30 seconds. He would stop after and smile and continue to play and I felt it was an integral part of his accepting his new sister. It's a way of establishing, "Yes, mom can take care of you both at the same time." It's hard to share mom. Tandem nursing is a great way to bridge the transition into sharing when a new sibling arrives, and this transition can begin as early as immediately after birth. Spreading awareness of this fact with post birth tandem nursing imagery, is an excellent educational birth & motherhood share. When we see healthy birth and breastfeeding images we can begin to accept similar experiences from life and we can have less fear and anxiety going into birth. This I think can change the landscape of birth itself and help to deprogram our culture from decades of fear-ladden birth imagery & video. Essential to a more peaceful and healthy community, which we desperately need. After the initial Nurse-In, I will launch a blog on this site, sharing the full set of images from my skin-on-skin tandem nursing shoot with personal reflections, and of course extensive imagery from the Nurse In. Until then, follow the Gathering In Tandem Story, Nurse Ins and Art Project on Instagram. Grateful to Layer Your Love for being the first to share the project with this post. Thank you to the women in the images on this page, and to the photographers who took them, for empowering me and tandem nursing women everywhere. 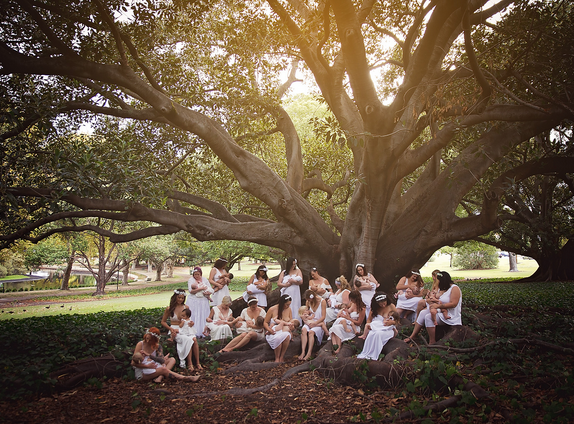 A very special thanks to The Honest Body Project and The Australian Breastfeeding Project in particular, for the inspiration and confidence they afforded me. Thank you to the people writing articles, gathering statistics and creating awareness around the benefits of tandem breastfeeding, for empowering us further. I'd like to point out The Badass Breastfeeder as a particularly strengthening resource. Thank you to my midwife, Karni Seymour Brown of Sunrise Midwifery, for her encouragement regarding tandem nursing. I had never seen a women tandem nurse before and felt intimidated and nervous about how to start the journey. She shared so simply and confidently and the short conversation had a lasting effect. Thank you also to her for holding space for the birth of our 3 children in a state of strong grace. Thank you to the breastfeeding group, Ventura County Nursing Mommas and it's creator Cindy Maynard, for providing an incredibly supportive space for nursing mothers to come together and share joys and challenges. The community came to my aid when I first shared my story publicly and first suggested a Nurse In, and I am immensely grateful for the conscious support. Thank you to my husband, Grant Gorman, for sharing Home Birth Documentaries with me before we were even married, for being selfless enough to support a tandem breastfeeding, co-sleeping mom, for listening to me about my nursing struggles with compassion, for doing the grocery store shopping for the last year when I was too scared to take the kids out on my own, and for sharing in the fears and triumphs with me and standing behind me, this Nurse In and this project with his whole heart. I would not be the women and mother I am without you. Thank you to the person who called the Sheriff and Human Services Agency. You have given me an opportunity to further carve out the cup of sadness that is my soul, so that I might fill it with just that much more joy. You have given me the motivation to create awareness and help better the world. You have given me the distinct challenge of further understanding forgiveness. And thank YOU for taking the time to read/visit/learn/join/share. 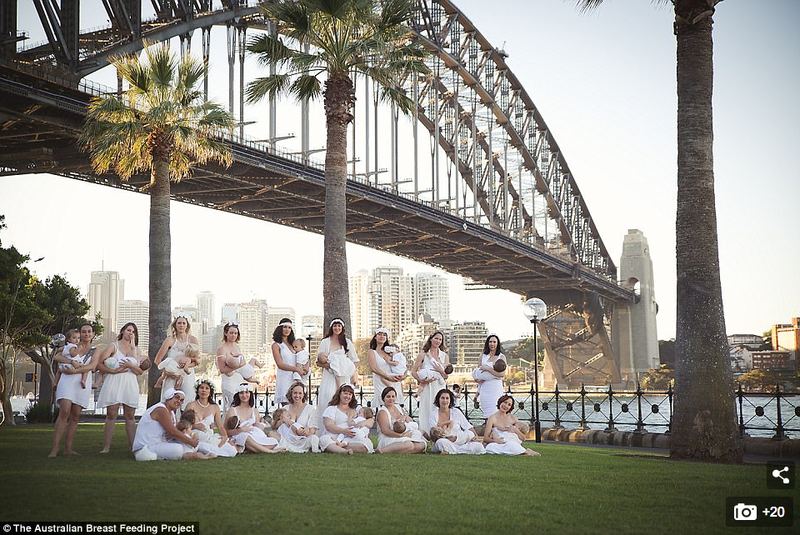 You empower all tandem breastfeeding moms with your awareness.